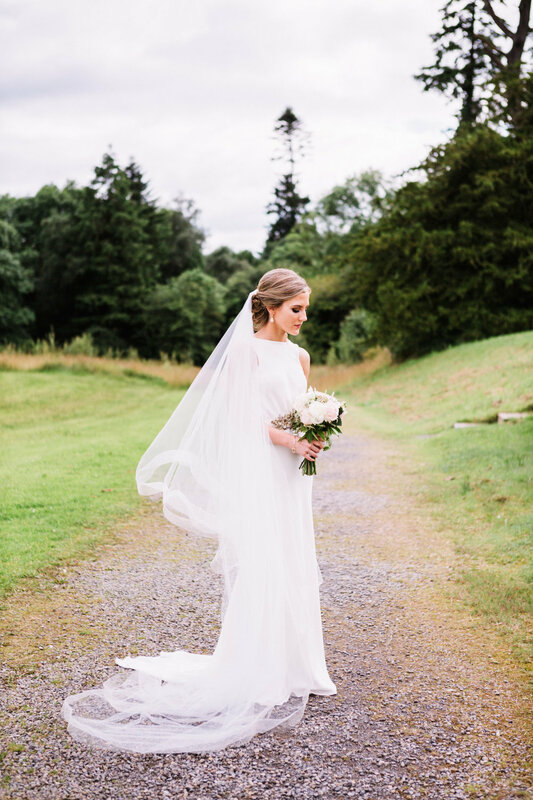 The relatively simple cut and line of Aisling’s dress only serve to enhance her natural beauty, (I could not stop looking at the photographs!!). Aisling returned to her home of Ireland to marry her sweetheart, and travelled from Birmingham and Manchester to visit me at my workshop (very flattering!). Aisling’s vision was clear from the start, a bias-cut silk crepe dress, that was slim on the hips, flaring subtly into a more dramatic train. The top was a little blouson at the front waist, but pleated into a plunging drape at the back, with an almost lapel-style fold back (that’s the only way I can think to describe it!). The back neckline was lined with an ivory Chantilly lace that was embroidered with metallic gold threads, and the scallops just peeked out from behind the draped fabric. The main feature of the dress was the detail of the embellished gold waist ribbon. We found various antiqued gold floral guipure lace trims and snipped into in individual flowers, leaves and vines, and re-embroidered the shapes back together, using the Chantilly lace as a base. Extra gold beads and crystal beads and applied to a matching gold silk waist ribbon. Hints of this embellishment were added over the shoulders too. Aisling’s oh so pretty photographs from her wedding at Kilronan Castle were taken by Sharon Kee (her website is here www.sharonkeephotography.com), who is also based in Ireland. Despite being a summer wedding, the beautiful greens and castle surrounds of the Irish castle are making me feel like a festive fairytale has just begun!